Above you see a man in a black suit in the center of a line of women wearing long white dresses with their heads covered by turbans. Some release doves while others hold vases with white flowers as a sign of victory. Who are these people? What does the scene represent? 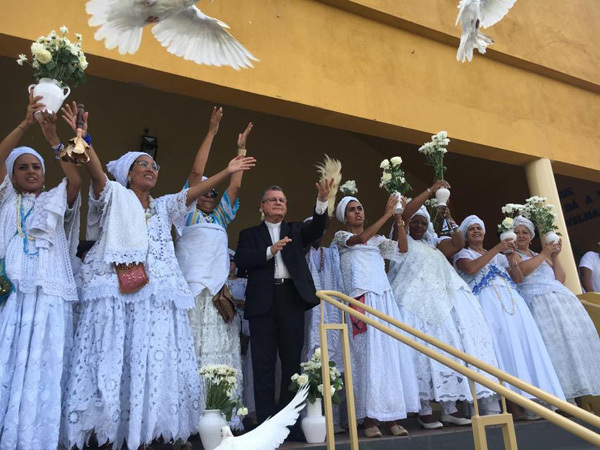 The man in the black suit is the Bishop of Bragança Paulista, Sergio Colombo, and the women in white are local members of the Brazilian version of Voodoo, called Candomblé or Macumba. The diocesan Council of Ecumenism invited the Voodoo members to come on January 13, 2019, to Bom Jesus Church in the Vila Bela neighborhood to wash the stairs of the church. According to the Candomblé, when their members wash the stairs of a site with water and herbs, they also wash out all the past sorrows of that area and instill in it the “blessings” of the orixás. The orixás are powerful spiritual beings or deities who can bless or curse human beings and other creatures. In their ceremonies, the Candomblé adepts dress in white or other colors to imitate the appearance of the orixás. For a representation of the orixás, see the last row below. Until Vatican II, the Catholic Church considered the Candomblé Satanic and taught that the orixás were devils. With the new progressivist theology, the sect is now considered good, worshiping the same God we Catholic adore.